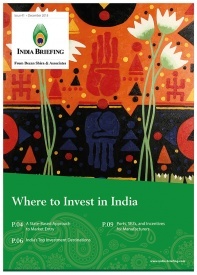 Amendments in Indian FDI policy last year opened a number of key business sectors to increased foreign investment and in several instances eliminate the need for foreign investors to obtain approval from the Indian government before investing. Additional 2013 policy changes that alter the legal definition of ‘control’ as pertaining to the determination of sectorial caps, as well as regulations for single and multi-brand retail trading are also important for foreign institutional investors (FII) and firms considering foreign direct investment (FDI). Government Route: For investment in business sectors requiring prior approval from the Foreign Investment Promotion Board (FIPB). Automatic Route: For investment in business sectors that do not require prior approval from the government, but the filing of a notification after the incorporation of the company and issue of initial shares. Foreign Direct Investment (FDI): The acquisition of shares or other securities in an Indian company. Foreign Institutional Investment (FII): Investment by foreign institutional investors (such as hedge funds, insurance companies, or mutual funds) registered with the Securities and Exchange Board of India (SEBI). These distinctions are important when interpreting recent changes in foreign investment policy, as foreign investment caps and approval routes often vary by both industry and investor. A changed definition of ‘control’ is also expected to apply to FDI in sectors where a sectorial cap currently exists. Prior to the 2013 amendments, companies were considered to be ‘controlled’ by resident Indian citizens if Indian citizens held a 51 percent stake in the firm and had the power to appoint a majority of directors in that company. Under the broadened definition of control introduced this year, ‘control’ now includes not only the power to appoint a majority of directors, but also the ability to control the management or policy decisions via shareholding, management rights, shareholder agreements, or voting agreements. Indian citizens must exercise ‘control’ under all limbs of this new definition for a company to be considered domestically ‘controlled’. Consequently, companies previously considered to be ‘Indian’ may now be viewed as foreign controlled and subject to FDI caps and other restrictions on downstream investment. While previous FDI policy only permitted one non-resident entity with ownership of a brand (or rights to a brand) to invest in Indian companies engaged in the retail trading of that brand, policy changes now allow multiple non-resident entities to invest in Indian entities engaged in single-brand retail trading of that brand (as long as each own or have rights to the brand via a legally binding agreement). Furthermore, the previous requirement for multi-brand retail trading companies (MBRTCs) regarding manufacturing and processing 30 percent of products in ‘small industries’ has been discontinued, and companies are now permitted to source their products from any manufacturing or processing entity so long as investment in plant and machinery is below US$2 million at the first engagement. MBRTCs are now also allowed to establish outlets in a wider range of locations, as the previous restriction to cities with populations of at least 1 million has been scaled back. State governments now possess the authority to permit MBRTCs to operate in their region. The issuance of shares by Indian companies falls under the compliance guidelines outlined in the Foreign Exchange Management Act (FEMA). Companies seeking capital through the public route should base the issuance price on SEBI guidelines. Unlisted companies seeking capital may not issue private shares at a price less than fair value based on the discounted cash flow method, and price will be determined by a SEBI registered merchant or chartered accountant. The acquisition of unlisted shares by a non-resident from an Indian resident must be exchanged at market price based on the SEBI guidelines. Units operating in SEZs may issue shares at a price based on the valuation against the import of capital goods. This valuation must receive approval from a Development Commissioner Committee and the appropriate customs officials. Shares must be officially issued within 180 days of receipt of invested capital, or the funds must be refunded to investors. Upon the issuance of shares to foreign investors, the issuing company has 30 days to file Form FC GPR, which outlines the company’s activities and relevant details, through the appropriate regional office of the RBI. A certificate declaring compliance with the Companies Act 1956 and Companies Act 2013, as applicable from time to time, shall be submitted at the same time. The issuing company shall also obtain a certificate confirming the price of issue is in line with the prescribed guidelines. 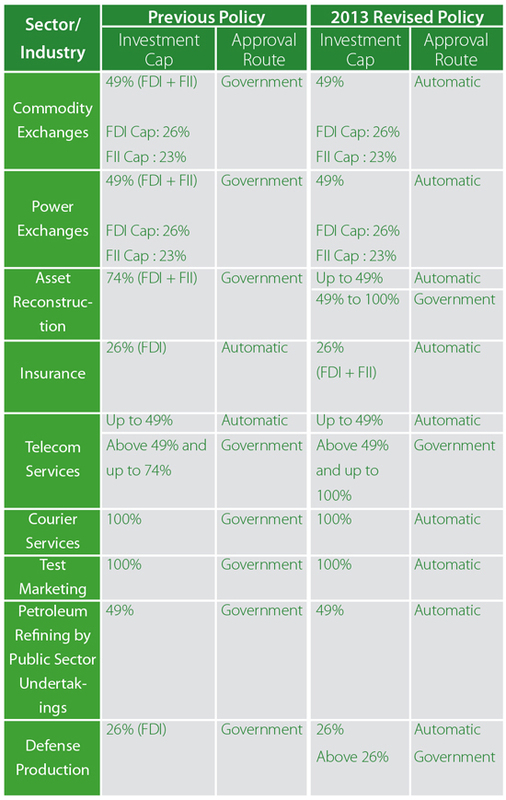 A number of changes in FDI caps have already been hinted at for this year. FDI caps and FII prohibition in the defense sector may soon be relaxed for investment promoting the development of ‘state-of-the-art’ military technology, and more recent developments suggest India may even move to liberalize business-to-consumer e-commerce, railways and the construction industry in the near future after FDI slowed considerably in the April-November period of the current fiscal year. In bonds, the government may transition from a fixed ceiling on FII in government securities to instead link limits to proportion of GDP. The government has already clarified that the existing 26 percent cap on foreign investment in the insurance sector also applies to intermediaries such as brokers, third party administrators and surveyors. Whatever the changes, foreign investors should be familiar with Indian investment regulations and compliance requirements before moving to invest in regulated sectors. Despite India’s liberalized investment environment, the nation still ranks among the most difficult countries in which to start and conduct business according to the World Bank. As such, firms and individuals considering investment in the country should strongly consider consulting a professional services firm before attempting to navigate India’s foreign investment environment. 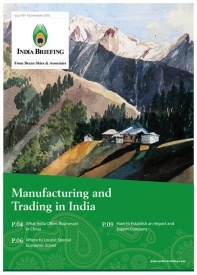 This article is an excerpt from the February 2014 edition of India Briefing Magazine, title “Taking Advantage of India’s FDI Reforms.” In this edition of India Briefing Magazine, we explore important amendments to India’s foreign investment policy and outline various options for business establishment, including the creation of wholly owned subsidiaries in sectors that permit 100 percent foreign direct investment. 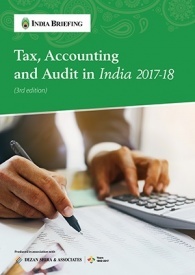 We additionally explore several taxes that apply to wholly owned subsidiary companies, and provide an outlook for what investors can expect to see in India this year. 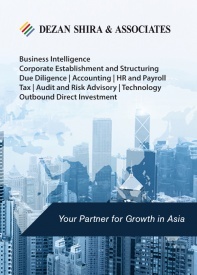 For further details about investment restrictions or to contact the firm, please email india@dezshira.com, visit www.dezshira.com, or download the company brochure. 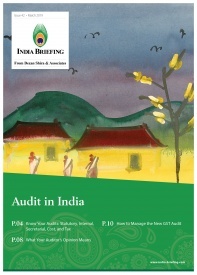 « Can Tax Cuts Breathe Life into India’s Economy?